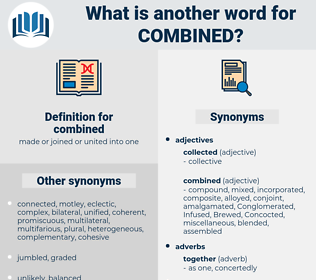 What is another word for combined? 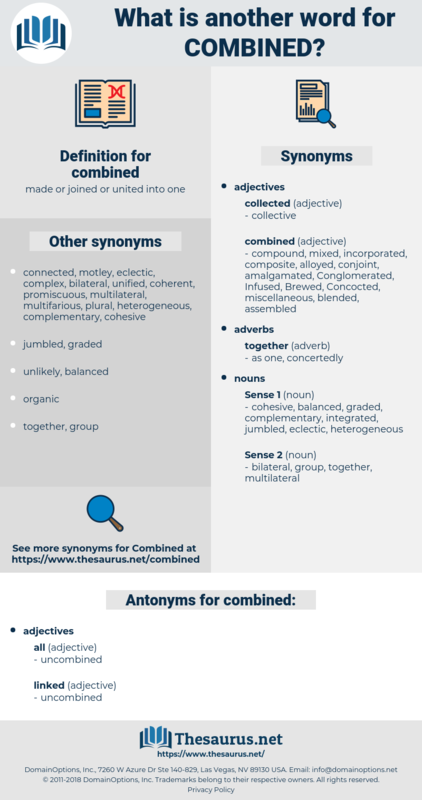 conjugated, concerted, conjugate, combining, accumulated, grouped, intermodal, coordinated, fused, regrouped, amalgamated, blended, co-educational, co-ed, joint, mixed, co-located, locked, report, double. divisions, Les, combining, Juntos, combo, consolidated, blended, joint, mixed, locked. amalgamations, sources, packages, handsets, Summaries, meetings, LINEs. Convened, Contributed, contained, Consisted, considered, Competed, Participated, Existed, intermixed, Conspired, joined, accompanied, included, enclosed, facilitated, reproduced, Collated, Enabled, associates, organized, contacted, manufactured, uncovered, Brought, Transferred, bind, endorsed, linked, reunited, collapsed, attached, used, permit, permitted, Attracted, produced, licence, Allowed, count, Helped, la, Met, rolled, Teamed, Reached, Resulted, framework, attended, Annexed, Worked, built, Resumed, Totalled, led, account, Accounted, Amounted, held, Rallied, Served, played, Took, conjugated, Les, regrouped, consolidated, joint, locked. incorporated, complemented, connected, intertwined, synchronized, Commingled, Convened, interconnected, Comprised, Contributed, composited, cooperation, contained, Compiled, reinforced, co-ordinated, Compared, converted, reconciled, intermingled, become, considered, come, composed, coalesced, Participated, confused, Introduced, categorized, Conflated, mainstreamed, Mobilized, insert, Inserted, inscribed, Mingled, determined, completed, Indicated, Computed, described, interfaced, outlined, joined, Constructed, concluded, accompanied, disaggregated, included, enclosed, Embraced, Complied, represented, correlated, homogenized, configured, Enshrined, accumulation, Rejoined, Attributed, balanced, induced, facilitated, synthesised, recorded, employed, augmented, Collated, reflected, subsumed, subscribed, enhanced, Enabled, Incurred, Managed, organized, transmitted, zone, relocated, Generated, covered, allocated, embedded, nomenclature, Administered, organised, exacerbated, significance, Submitted, cost, summarised, assigned, contacted, e, identified, bound, engaged, increased, Brought, implicated, coupled, isolated, Obtained, compounded, classified, Duplicated, endorsed, circulated, acquired, documented, interlinked, Performed, perceived, Ascribed, observed, responses, add, mirrored, modified, Amplified, continued, exaggerated, confounded, ripened, enrolled, reported, Achieved, Supplemented, realigned, conducted, linked, accepted, divided, located, moved, expanded, arranged, kingdom, Emerged, reunited, collapsed, attached, Entered, magnified, withdrawn, presented, Indexed, recourse, sent, noted, published, Referred, unparalleled, adapted, Undertaken, Equated, worsened, developed, Intruded, provoked, addendum, replaced, separated, Filed, obliged, sustained, Appended, registered, used, permitted, furnished, supported, filled, produced, partnered, specified, spending, Tabulated, expenditure, Borne, deducted, Allowed, Arrived, Followed, assumed, burdened, pyramided, unbundled, Created, Laminated, liaison, Been, tied, allotted, Discussed, placed, established, revised, reunified, Escorted, centred, response, aligned, thanks, paired, fulfilled, clustered, structured, Helped, prepared, treated, Whilst, Met, rolled, population, Detained, valued, ensured, Revoked, background, given, baffled, Displayed, Reached, Resulted, Cantoned, aggravated, attended, area, Channelled, Dubbed, Annexed, stacked, crewed, twinned, listed, Worked, known, packaged, Quoted, Captured, mistaken, formed, Subjected, weighted, laid, built, Provided, matched, assisted, laced, granted, sampled, Lumped, designed, Accorded, doubled, steps, realized, Totalled, packed, backed, Caused, found, Supplied, drawn, secured, led, lined, Shown, Amounted, said, held, charged, scheduled, Pegged, Served, Housed, Adduced, paid, put, Asked, kept, Awarded, read, played, founded, have, Had, \, taken, seated, done, stated, states, based, tried, cut, conjugated, made, concerted, accumulated, Cumulated, grouped, coordinated, fused, regrouped, consolidated, locked, report, double. individual, separate, one-sided, sole, private, personal, specialized, unilateral, one-way, several, particular, independent, esoteric, solitary, one-man, special, single, exclusive. The garments he wore that day were black cloth, and their cut, combined with his manner, gave him the appearance of a working man of the better class taking a holiday. In 1841 the libraries of Upper and Lower Canada were combined, and from this year dates the establishment of the library of Parliament.